Girl Waits With Girl is written by Amy Stewart of the Nature Can Kill You series (Wicked Plants, Wicked Bugs). 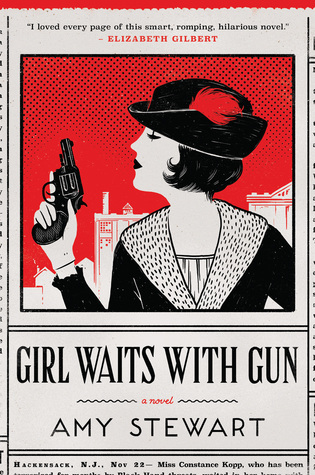 I thought Girl Waits With Gun was an odd departure from her usual non-fiction. What I didn't realize is that Girl Waits With Gun is a fictional story of a real person: Constance Kopp. Constance and her two sisters, Norma and Fleurette, lived on a farm in New Jersey where they kept to themselves until an eventful trip into town threw them into the spotlight. On this day, their buggy was struck by the automobile of Henry Kaufman, the wealthy and powerful owner of the silk factory. Henry, a belligerent bully with a car full of thugs, refuses to pay for the damages to the ladies' only means of transportation. Constance wouldn't have it! She demands payment and makes a couple of visits to Kaufman's office. Not only does she find herself rebuffed but threatened. And so begins a year of threats, stalking, harassment, even arson. They seek the help of the law, but only one man stands up to the bullying of Kaufman. Eventually, Constance has to take matters into her own hands. Stewart mixes fact with fiction, filling in the details of lives of these historical characters. Some of what takes place in the book really happened and a few things didn't. The chapters begin with excerpts from newspaper stories written about these events. The personalities of these people are expanded, though based on fact. Constance was as tough in real life as she is in the novel. A tall woman with very strong opinions. The women choose to live alone without any male relatives to take care of them. They were independent and felt they had that right, even though they are constantly questioned about it. I found it infuriating that the first thing anyone asks is if they have a man to protect them. Would having a man around have prevented this criminal from harassing them? I doubt it. This gang threatened everyone. They do after all have some protection from the police but even that's not enough. Constance stands up for herself and her family. I enjoyed Girl Waits With Gun. It was entertaining and proves that truth is stranger than fiction. I did find it a tad long for a detective story, but it didn't lag. I'm looking forward to Lady Cop Makes Trouble. I could watch that gif over and over. That snake moves scarily fast. I can't decide if they speed up the film or not. This sounds fascinating. And now I want to learn more about Constance and how she took matters into her own hands. Women not needing a man to protect them - what a concept!!! I had to google that gif after I found it. It turns out it was a prank a guy played on his sister with a fake snake. She's pretty quick though! That sounds so good! That gif creeps me out! Hmm, I'm not sure what the other reviews said. I bought this one on sale. It was pretty cheap. Maybe worth getting and checking it out? See, I can't stand historical fiction set in America (I know, I'm not a true patriot :p), but even I am tempted by this book. And its cover! And its excellent title! And its sequel's excellent title! You might like this one. It's very lady empowering and based on a real lady. Armchair BEA: This Is Me. This Is My Blog.